It is important that you maintain good oral health. For this you have to brush daily, floss your teeth, visit the dentist regularly and maintain oral hygiene. If you neglect any of these, it can cause damage to your teeth and gums. Plaque formation occurs due to improper brushing. Tartar is the result of ignored gums. 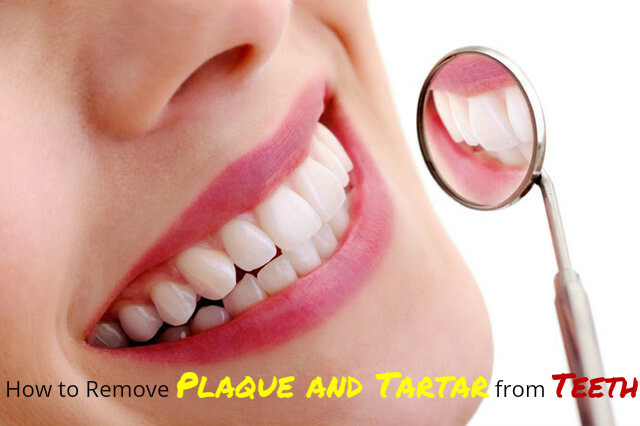 You should know how to remove tartar and plaque so as to prevent any other serious oral diseases. Brush your teeth properly after every meal. This helps in preventing the formation of tartar. You should brush at all angles and use a soft bristled brush for this purpose. This way your teeth will be cleaned thoroughly. Remember to use your brush at a 45 degree angle to the gum line. To remove the hardened tartar from your teeth, use a dental pick available in stores. Gently scrape off the tartar with this. Spit and rinse your mouth as you do so. You have to do this gently, as picking deep into the gums can cause an infection. Take a teaspoon of baking soda and mix it with a pinch of salt. Wet the tooth brush slightly and dip it into this baking soda mixture. Scrub your teeth with it and then rise off. This is very effective for removing tartar and for making your teeth whiter. Sesame seeds are also effective for removing tartar from your teeth. Take a handful of sesame seeds and chew them slowly. Do not swallow them. Now brush your teeth with a dry brush when you still have the chewed sesame seeds in your mouth. These seeds act as a natural scrub and help in cleaning and polishing the teeth as well as the removal of tartar. When you eat food, it can get trapped between your teeth. So, it is important that you remove them to prevent tooth decay. Flossing is very effective for removing these food particles and the plague. Floss your teeth regularly after gargling. This can prevent the formation of tartar and help you maintain a good oral hygiene. Floss not only helps in cleaning between the teeth, but it also cleans between the gums. So, it helps in preventing tooth cavities as well as gum diseases. Munch an apple, carrot, celery sticks or musk melon, and you can get rid of the tartar. Chewing them about one hour after your meals is a good way to clean your teeth naturally. It removes the food particles, plaque and tartar from your teeth. In addition it also makes your gums stringer. A good way to make your gums stronger and to clean your teeth is to eat figs. Try to eat 3 to 4 figs and chew them together slowly. This helps in stimulating the salivary glands and increasing the production of saliva. This way you can clean your teeth and remove plaque and tartar from your teeth. Fluoride toothpastes are effective for increasing the concentration of fluorides in the teeth. This helps in strengthening the teeth and prevents cavities from forming in the teeth. It also makes the enamel on your teeth stronger, so that they do not suffer much when you consume acidic foods and drinks. Fluoridated pastes also help in preventing tooth decay, by re-mineralizing the areas affected by decay. Moreover, it protects your teeth from the bacteria that cause tartar formation. Remove tartar by using an antiseptic oral cleanser or hydrogen peroxide. Take 1 tablespoon of antiseptic mouthwash and mix it with 3 tablespoons of 3% hydrogen peroxide solution. You can take 10 ml of this solution and gargle with it for a minute or two. This helps in oxygenating the edges of your gums and the surface of your teeth. As a result, the tartar gets loosened and you can remove it from your teeth. Gargle with this liquid after every meal or at least once daily. Rubbing orange peel directly on your teeth is another way to remove tartar from your teeth. Leave it overnight and then rinse in the morning. You can also make a paste or powder of orange peels and apply it on your teeth. This helps in destroying the microorganisms in your mouth. Take one cup of water and add 1 teaspoon of aloe vera gel, 4 teaspoons of vegetable glycerine and 10 drops of lemon essential oil to it. Mix well and store this liquid in a container. Scrub your teeth with this mixture daily and this will remove tartar form your teeth. Using tartar control tooth paste is great for getting rid of tartar and plaque. These pastes contain chemicals like zinc citrate, pyrophosphates, fluoride and others. These prevent the formation of tartar on the teeth. Some of these pastes also contain an antibiotic called triclosan, which can kill some of the oral bacteria. You can use electric toothbrush to clean your teeth they are better than the normal toothbrush that you use. They help in getting rid of tartar and also keep your teeth clean and bright. Dentists also recommend electric toothbrush as one of the best means for cleaning the teeth and for keeping your teeth free from plaque and tartar. Take fruits rich in Vitamin C, like tomatoes or strawberries. Make a paste of this fruit and apply on your teeth. Wait for 5 minutes and then you can wash your mouth with a mixture made with warm water and baking soda. This helps in getting rid of tartar and killing of bacteria in the mouth. Including fruits rich in vitamin C in your daily diet is an easy way to ensure oral hygiene.